This companion to Kryger et al. 's PRINCIPLES AND PRACTICE OF SLEEP MEDICINE focuses on the diagnosis and treatment of a full range of sleep disorders in children. Recognized leaders in the field offer definitive guidance on virtually all of the sleep-associated problems encountered in pediatrics, from sleep and colic...to obstructive sleep apnea, neurological disorders, and hypersomnias...to sleep-related enuresis. Presents up-to-date information of the field's hottest topics in chapters on Pharmacology of Sleep in Children · Epidemiology of Sleep Disorders During Childhood · Circadian Rhythm Disorders: Diagnosis and Treatment · and Differential Diagnosis of Pediatric Sleep Disorders. Organizes information into separate sections covering normal and abnormal sleep, for quick reference. Makes further investigation easy with abundantly referenced chapters. Addresses both medical and psychiatric sleep disorders. Features the expertise of Drs. 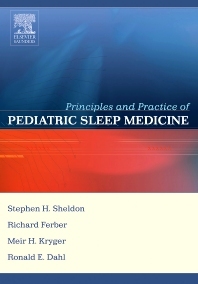 Sheldon, Kryger and Ferber - renowned authorities in the field of sleep medicine.